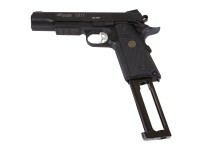 Choose this realistic 1:1 Sig Sauer 1911 Tactical CO2 BB Pistol for all of your training needs. It's been engineered to measure up to the original firearm platform and is similar in weight and handling as well as performance. Tech Tip: If your CO2 cartridge is partially pierced, you may experience low velocity and weakened blowback. To resolve this, we recommend backing off the tightening screw in the bottom of the magazine slightly (about 1/4 turn) once you initially pierce it. Then simply tighten the screw back down, this should aid in fully piercing the CO2 cartridge. 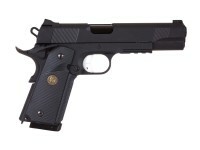 Things I liked: Very accurate 1911 copy and seems to be very well made , love the packmyer rubber style grips , finish seems well done for co2 B.B. pistol , has a nice trigger and breaks clean . Trigger has adjustment for travel and there is no Warning Signs all over the sides of the gun. Gun is very accurate using Umarex steel bbs. Things I would have changed: Pistol was very dry and continued to jam slide back , would not lock into battery- simple fix - remove slide from frame,grease slide rails with good gun grease or slide glide grease using Q tips for application , also using Pellgunoil to lube co2 valve and all metal on metal moving parts -less is better.these pistols need to be lubed at the factory. What others should know: Very important for all my co2 blowback bb pistols- using one drop of Pellgun oil in bb mag exit point and in spring area of mag ,all my jamming has completely stopped in all my blowback BB guns this really seems to make a difference. These pistols are also very easy to modify . Things I liked: Great weight look and operation, right out the box i went thru 2 Co2s with a tight grouping at 20ft. No problem with leaks or jams so far . 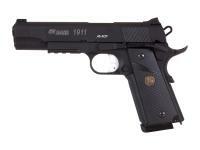 This is a beautiful replica 1911. I have the Tanfoglio which is a solid gun too. I like the mag bumper as that adds realism as well and no white writing on right side slide ! Also this seems much more powerful than my Tanfoglio but i havent chrono'd it. Things I would have changed: Not much, loading is easy, but the trigger is hair. Prolly about 1/2lb pull. So dont ride the trigger when locked and loaded. What others should know: Proper oiling of co2s and occasionally the slide is vital to all air gun maintenance. Remember folks this isnt made from real gun medal, the slide has to be loose for Co2 recoil. Dont expect this to last like a real gun if use it heavily. 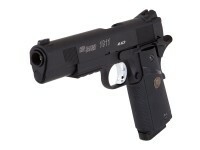 But i'm very happy with this gun as i love to collect 1911 replicas. Also, if you know anything about 1911s you dont need instructions for this gun, you can field strip it completely and I recommend using a real gun oil to lube the orange bb housing, its made of plastic with a light spring as it needs to move back and forth, this is what causes jamming if not lubed. Things I liked: This is my second pistol now I have the pair this is really a well built gun that Sig has put together you will not regret owning this gun. Things I would have changed: Try different finishes some chrome, trick it out a bit. What others should know: Buy extra mags guns pretty economical on co2 but your going to like shooting a couple of mags at a time I have five and it's really cool. Does it have a rifled barrel? There is a small tab near the top of the mag, LH side, that must be pushed in to allow the BB spring follower to be slid down using your finger nail or whatever. Does it slide back when the clip is empty? Yes, I believe the small tab mentioned above does it. 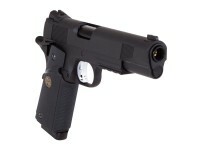 It will stay open with the mag released and can also be released and held open with the slide lock, mag in or out.